Selling vintage on Etsy is super different than selling handmade or supplies. 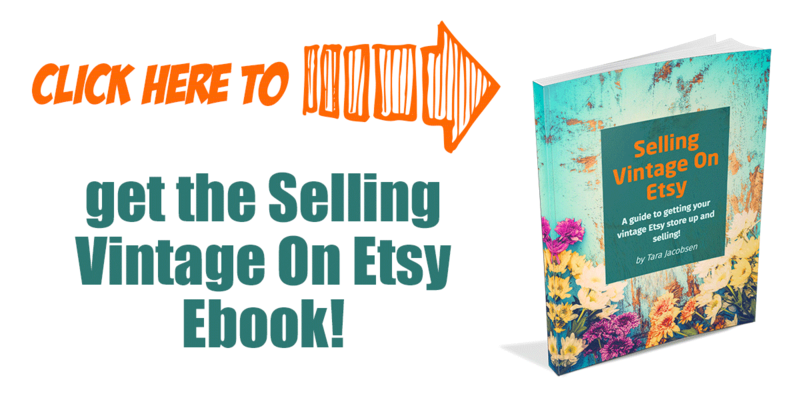 I feel like most of the information out there is for these types of sellers so I wanted to talk a bit about some things that are specific to just vintage Etsy marketers! If you are thinking about selling “non handmade items” on Etsy, they have to be “vintage” meaning over 20 years old. This is a rule and selling items that are not that old is a violation of the Etsy terms of service. This makes finding items that are “safe” to sell a little harder. When you are sourcing materials from “real” companies, you can pick and choose what you want to sell. But vintage is different. It just depends on what you can find at the time you are looking. You may want to sell old vintage clothing, but not find much of that in your area if you live in suburbia. Or want to sell vintage cowboy items but live in New England which would make sourcing those things hard. So one thing you can do as you are considering what to source is figure out what you have the most of… here is the list of my categories again, but with the number of items in my shop. It is really easy for me to find tools and home decor at the estate sales in Florida. Some areas don’t have great estate sales or have more auctions, it all depends on where YOU live and what YOU can find. Estate Sales – This is my main source for products. Because I live in Florida where the population is older, there are more people clearing out estates. I use the website EstateSales.net to find ones in my area. Antique Auctions – These are higher end auctions where the auction houses have specifically niched down to selling only vintage items. You may pay a bit more, but oftentimes the quality is much better than at “regular” auctions. I use the site AuctionZip.com to find auctions in my area. Regular Auctions – We have a TON of regular auctions going each week around here. The amount of “stuff” sold in the United States is overwhelming and there is always someone looking to clear out their home or business. These auctions are much more broad and could have current or vintage items, you just have to sort through the offerings. The nice thing about these is that you can get a large amount of inventory very quickly. They are on Auctionzip.com or sometimes in the local papers. Yard Sales – I am not a fan of yard sales for vintage, simply because I don’t have the time to go to so many to find a few vintage items that would qualify on Etsy. Ebay sellers can do more yard sale-ing because they can sell both new and old items. If you are going to be hitting a bunch of yard sales, it is best to have an app on your phone that will help you organize them! I have heard good things about Yard Sale Mapper. Craigslist – Many people list items for sale on Craigslist. A quick peek today at Tampa’s antique items for sale shows items from $15 to $18,000 for the contents of an antique store. I find that Craiglist pricing is a bit high for me to be able to make the kind of profit that I like, but if you don’t have the other sources that I do, it is a great place to look. Friends and Family – One of best sources of (free) products is my Mother In Law. She likes to shop so she sometimes will give me things she is replacing. A cool vintage birdfeeder from the back of her house was a great sale on Etsy for me. Now, this is much different than selling it FOR her. I don’t do consignment, but am happy to take donations! Let everyone around you know that you gladly accept donations. Margins are a somewhat touchy subject so I will just tell you how I think and you can make the decision on your own! I like to try and get at least 10X the margin on items I sell. So if I buy something for $1 I expect to NET at least $10. That means that I would have to be able to sell it for $12-15 and charge shipping rather than absorbing that cost. More often though I want to buy things for a $1 and sell them for $20-30. As I have gone on I have decided that if I list too many “little” items I get discouraged about the amount of work versus income I am getting. Another way to do it is to buy things that sell for more and then pay a bit more to acquire them. So you buy a piece of art for $25 and sell it for $200, you have not gotten as large a percentage spread, but you have made more money and had way less work than selling twenty $10 items. I use a spreadsheet to track my costs and sales amounts. 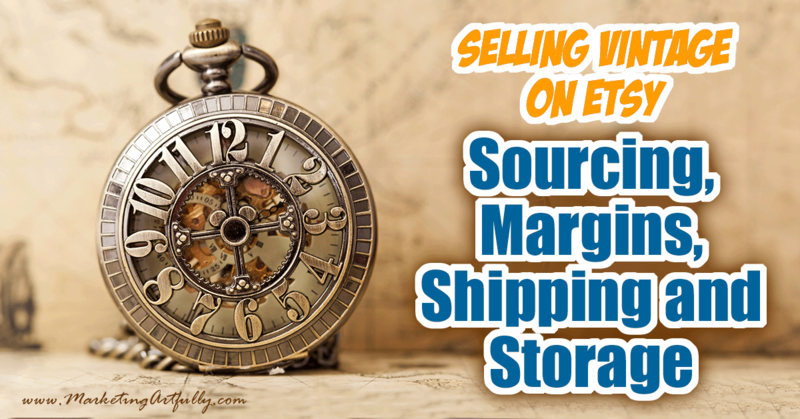 I want to know which items I sell have the highest margins so that I can concentrate more on sourcing those kinds of things. In my shop the highest margins by percentage are silver plate items. I can buy them in lots at the antique auction for $.75-$2 a piece, list them for $20-30 and and ship them out reasonably easily. I know that some people like to use their “gut” instinct to figure this out, but I find that simply recording costs and sales is the easiest way to know the facts about my business. For example, I had heard that selling games was a great money maker. So I went and sourced about 4 games for $3-4 each. I sold them for $20-30 each and was super stressed out that they didn’t have all the pieces and were more bulky and heavy to ship. Those margins were not high enough to make it worth it for me! On the other hand, buying a screwdriver for $.25 at an estate sale and selling it for $12.50 on Etsy isn’t a big money deal but the margin on that item is awesome. Okay, now to shipping. This is what FREAKED me out the most when I started and what keeps some people from even starting at all. 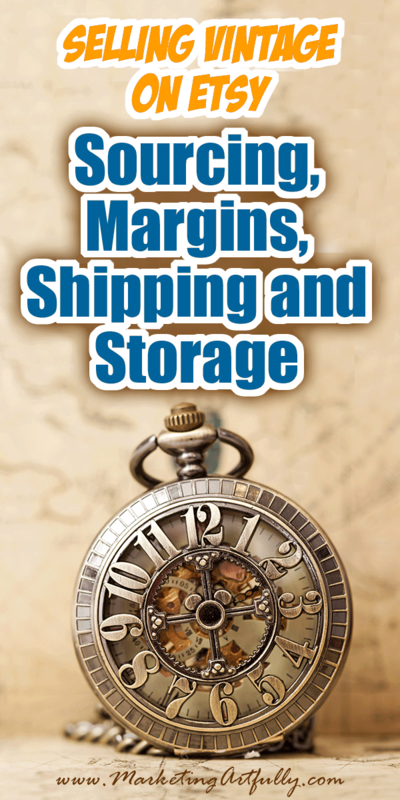 Shipping IS a big deal and something that should be a focus of your efforts to economize your money and time on. Priority Mail Flat Rate – This is an amazing service if you are shipping heavy things. BUT if you are shipping things from about 1-5 pounds oftentimes it is MUCH cheaper to ship something regular Priority than in flat rate box. For example, a 1 pound item shipped in a medium priority box will cost you $11.95 with the Etsy discounted shipping rates and about $7.16 regular priority with the discount. Free Priority Boxes – I thought that there were only free flat rate boxes, but they have LOTS of different boxes that are not flat rate but still priority. The 7X7X6 is my personal favorite. Still priority but not flat rate! Priority Padded Envelopes – These little darlings are even cheaper! At just $6.10 you can get A LOT of product in there for not a lot of money. When you pair them with a Scotty Stuffer box, you can save money and make sure your items get there safely. Buying Boxes – I used boxes we had around the house to start and that worked okay, but then I started stressing out about having to use bigger boxes than I needed much of the time. With that in mind I bought some 8X6X4 boxes that are a great small size and still fit in my mailbox to leave for my mail lady. I KNOW, it is an expense, but if you are going to be selling on Etsy professionally, that is just the cost of doing business. (these are not big enough for international shipping). Buying Blank Shipping Labels – One of the best things I did was buy like 1,000 precut in half shipping labels on Ebay. Just do a search for “Laser Printing Shipping Labels” and you will see the pre-cut half page labels that print perfectly from your Etsy postage. Another cost of doing business but at $.025 each that is almost not a cost and is SO worth the time it saves. Buying Bubble Mailers – Another thing I bought (after I made some money) were bubble mailers (mine are pink, yours could be a normal color!) These are great for shipping things that are not super fragile but you still want to protect. They are very light and don’t add to the cost of mailing often. Shipping Internationally (Should You Do It?) – One thing that people seem to be most confused about is shipping internationally. I do it and have not had any trouble. It increases your sales and is not hard to do at all. The one problem is tracking your items. Once it leaves the US, many times it is off the grid and can take a bit of time to get there. I am not worried about that although mostly I do message the person back and “confirm” their address just so I can make sure they will talk to me! 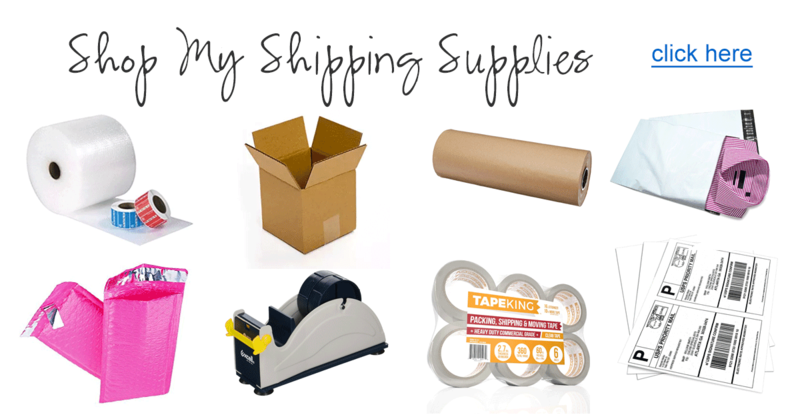 Shipping Internationally Details – You just need a few things to ship internationally. Your box has to be at least 10″ on one side to put the sticker label. You need international shipping label holders (free from the post office) and then just print it out like normal on Etsy. It is 4 plain pieces of paper and you have to sign each one or they could return your item. That is it! Should You Charge For Shipping? When I started I had advice from a friend to do free shipping because Amazon has conditioned people to expect free shipping. So I did and it was a disaster for me. First off I was priced MUCH higher than other people for the same items because I built the shipping cost in and they were not. Second off, I was paying final costs on shipping in addition to the real price of the item. Lastly if you get a return there there is a problem with having the shipping rolled into it. I haven’t had a return yet (fingers crossed) but have heard some real problems on podcasts that I listen to. So for me, charging a fair shipping amount just makes good sense. It takes the guesswork out of it for me and is fair for the buyer. I do keep the difference in the discount to help pay for shipping supplies that I use and handling. Last but not least is when someone messages me about shipping costs. I have heard A LOT of Etsy sellers on discussion boards go crazy about getting messages in the bad way. They have an adversarial tone and are mad. I take another tact, I see if the person is right and then try to help. For example, a fellow messaged me and said that a box I had for sale was possible to squeeze into a small flat rate box (he was right!) Now this is not the way that I would normally ship it, but I set a fixed price for that item to ship (in the US only) and messaged him that I would leave it that way overnight. He bought it, was happy and so was I! Last but not least is storage. Sigh. With vintage items you probably cannot do a “one size fits all” storage solution because your items will vary in size and shape. Make Sure You Know Where It Is! – There is nothing worse than having to dig through all your boxes to find something. So on that spreadsheet of mine I put the location of the item. I just put Etsy 1 (for the first Etsy box) or Switchplates Old (for the box of just old switchplates). It doesn’t matter what storage system you use, knowing where it is is the most important thing. You could also put its location at the bottom your listing if you don’t use a spreadsheet! Start Out Small – I was lucky that we moved just as I started my shop so I could set it up on big shelving units in the garage, but before that I just had an “Etsy 1” box in my closet. Don’t wait to start just because you are worried about what to do later! More Of One Thing – Once I found out things that I would have lots of I started making boxes with just those items instead of leaving them mixed in. My first “speciality box” was Architectural Salvage where I put all of the house parts. Label, Label, Label – It is SO important to label your boxes. You can use a 1,2,3 system or a “call them what they are” like Silver Stuff, but it is SO tempting to think that you will remember everything and so easy to get confused. Store Precious Things Indoors – I know that most of us are using a garage to store things, but if you have delicate items try to store them in a closet or other climate controlled area. It gets HOT in Florida and leaving old photos or other delicates to warp or get damaged is a bad, bad idea!